Hohepa is a community for children and adults who have intellectual disabilities. Through living, working and taking an active part in community life alongside co-workers, residents grow to experience satisfying lives with as much independence as possible. For residents and staff, our Vision is that ‘every life is fully lived’. The principles of Rudolf Steiner’s work are the foundation of what happens within Hohepa. It is this understanding of the human being that creates Hohepa’s distinctive approach to working with people with disability. Therefore curative education, social therapy, a rich cultural life and biodynamic farming combine here to make Hohepa unique in the way it stimulates the development of body, soul and spirit. Therefore, the foundation of our workis the understanding of the human as a being of Body, Soul and Spirit. In the diagram on the right, we can see how these three aspects work together. In working with disabled people, we are interested in considering wellbeing with each of these aspects. 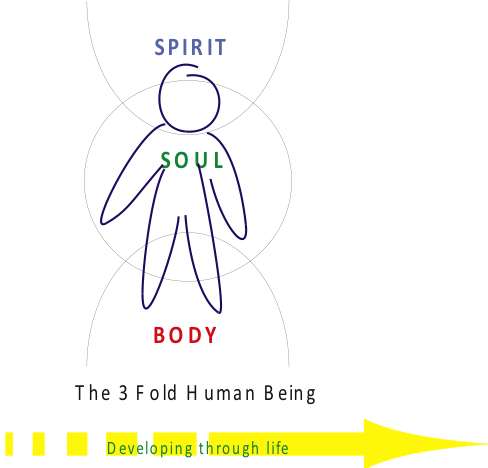 So we need to first understand what Body, Soul and Spirit are, and what wellbeing looks like at each of these levels. This means therefore that the focus at Hohepa is more than on physical care and comfort or even skill development. It is also about how the soul and spirit can be respected and strengthened that every person can be more soundly on the earth. To be ‘well’ the body itself needs feeding, exercise, care, hygiene and maintenance. When it has these things the person develops a sense of belonging and a sense of trust. (We know this when we reflect on a baby or young child). 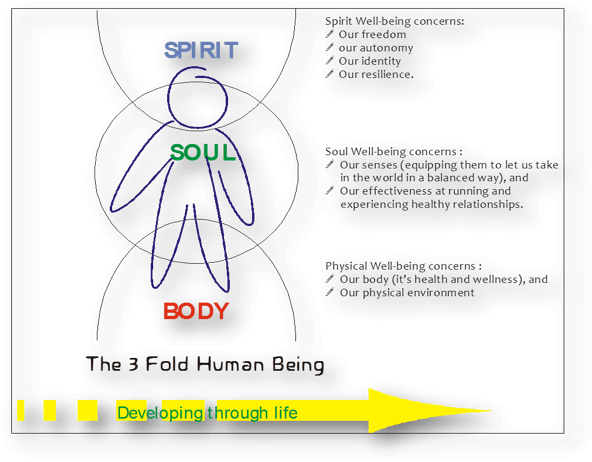 If we look at the diagram, the soul is the middle realm between our physical body and our spirit. The soul is where we meet ourselves and our world. So the soul is all about relationships – relationships with ourselves and with others. A healthy soul is one that has rich and full experiences (where we connect to the world and people around us). For this to happen we need skills – social skills, communication skills, work skills. Being in the ‘middle’ our soul is a place of movement – between the ‘fixedness’ of our physical being and the freedom of our spirit or individuality. We can recognise this in situations when we feel like doing something (this is our soul speaking), but we cannot muster the energy to make it happen (the weight of our physical being). It is only the strength of our ego – our individuality or spirit – that can break through that resistance towards freedom. We can build this spirit wellbeing through careful thinking – thinking that lets us make sense and meaning of where we find ourselves in the world and the possibilities that are in front of us. E.g. knowing that from blossoms bees gather pollen and nectar, create wax to store honey. That their wax can be used for us to create candles that give out light – light the same as the sun gave the flower. Our gateway to the spirit is through our soul’s capacity to call up a sense of reverence, respect, gratitude and humility. And such practice in turn creates health in the physical body.